OREF works in close partnership with THAW Orkney, a local charity working to alleviate fuel poverty. 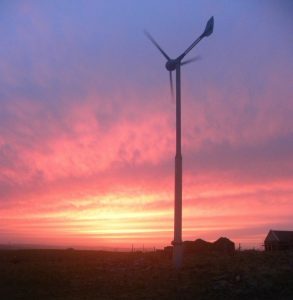 A part of this work is the Feed-in Tariff (FIT) Recycling Scheme, which allows wind turbine owners (or people with solar panels or other renewables) in Orkney to contribute a part of their subsidy income to THAW’s work to provide affordable warmth in the county. In Scotland, a household is defined as being fuel poor if heating the home to an appropriate temperature costs, or would cost, more than 10% of household income. In Orkney, as of 2016, 63% of households and 85% of households containing pensioners are in fuel poverty (figures provided by THAW). Some of THAW’s clients are spending over 40% of their income in heating, while others are living in freezing conditions as they cannot afford warmth. THAW works to improve access to affordable warmth by providing advice and funding to local residents. This funding may be direct, or it may be used to provide a “householder contribution” and “unlock” other sources of help. Most domestic wind turbines receive an income from the Feed-in Tariff, which is paid for by a small socialised addition to everybody’s electricity bills – including those who can’t really afford it. The scheme allows turbine owners to contribute a small part of their FIT income – we suggest 5% – to THAW’s work. The money will be ring-fenced by THAW and used only on improving homes fuel poor homes in Orkney. OFGEM’s annual report says that in 2015 the entire FiT scheme cost £866M across the 26.473M households in the UK (Note 99% of installations were for solar). The cost was therefore £866M/26.473M = approximately £32/year per household. With 10,000 households in Orkney each paying approximately £32 for FiT on electricity bills ths amounts to = £320,000pa. As of the end of 2016 there is 17,864kW of eligible FiT wind generation and 1,341kW of PV totalling 19,205kW in the county. The most profitable installations are wind, so this calculation will ignore PV. Spreading the £320,000 across the wind generators would mean that each generator benefits by approx. £320,000/17,864 = ~£18/kW installed per year from Orkney residents. This means the socialised cost to Orkney of a 5kW wind turbine is therefore approximately £90/year. The income will be of the order of £3750. The donation can also attract Gift Aid adding 25% to the value of the donation.